There’s also a mini triathlon, junior motorcycle speedway and the Proston Golden Spurs Campdraft. At Kumbia Oval, the Rattlers will take on the Nanango Scorpions in the Preliminary final of the B Grade cricket competition. This will decide who will face Blackbutt in the Grand Final next weekend. Play is due to get under way at 12:30pm. Junior cricketers will be turning pink in Kingaroy for their Pink Stumps fundraiser. The Kingaroy Junior Cricket Club’s Pink Stumps Day will run at Lyle Vidler Oval from 8:00am to 5:00pm to help raise funds for the McGrath Foundation’s breast care nurses. There’ll be matches between eight local teams from Kingaroy and Nanango between 8:00am and 4:30pm, along with a $2 barbecue lunch between 11:30am and 12:30pm. Round 1 of the South Burnett Soccer competition will feature men’s and women’s games at Tom Alford Oval in Kingaroy and at the Wondai soccer fields. In Kingaroy, Wests will take on Gunnettes in the local derby at 3:15pm, followed by the men’s 1st Division game between Wests and Gunners at 5:00pm. In Wondai, Barambah will play Nanango in the women’s game at 2:00pm, followed by the men’s game at 3:30pm. There will be no South Burnett United team in the Toowoomba Football competition this year, which means 2nd Division Men’s games will resume in the local competition. However, no 2nd Division Men’s games will be played in Round 1. The junior soccer competition will kick off on April 27. In Rugby League, the fact that last year’s Premiers Nanango Stags won’t be fielding a team in A Grade this year has left just four teams in the senior competition. The withdrawal of Nanango was first reported in February but the release of the draw for Round 1 has confirmed the sad news. Games will be played at Cherbourg, Wondai and Kingaroy. In Cherbourg, junior games between the Nanango Stags and Cherbourg Hornets will be at Jack O’Chin Oval from 9:00am. 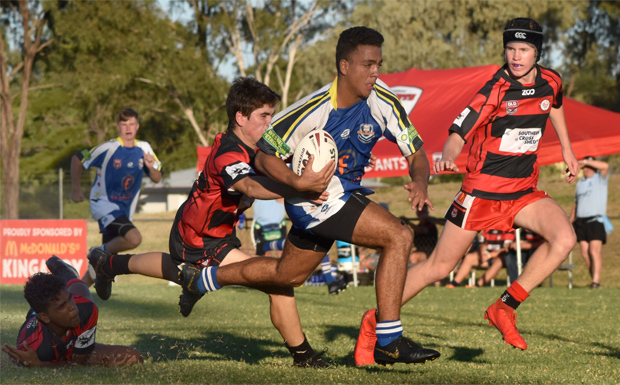 At Wondai Sportsground, the Wolves will play the Central Burnett Brumbies in junior games from 9:30am. These will be followed by the first A Grade match of the season, between the Wolves and Cherbourg Hornets, at 3:30pm. In Kingaroy, the Red Ants will play Murgon at T.J. O’Neill Oval with junior games from 8:00am. At 3:30pm, the U18 South Burnett Eagles will play their first game for 2019 in the Toowoomba competition, facing Highfields. At 5:00pm, Kingaroy will play Murgon in A Grade. The South Burnett Saints are still a week away from Round 1 of the Darling Downs AFL competition, but both teams will be in action this weekend with pre-season games. The Saints men’s and women’s teams will be playing trial games against the Toowoomba Tigers at Fernvale Sports Park on Saturday. The women’s game will kick off at 1:30pm followed by the men’s match at 3:00pm. The three-day Proston Golden Spurs Campdraft will be continuing across the weekend at the Proston Showgrounds. Events include a Charity Maiden, children’s events, Novice and Open drafts. The Spurs is always a big event and spectators are welcome to watch the action for free. The Kingaroy Bees junior motorcycle speedway club will be holding their first Club Day for the year at their track at the Kingaroy Showgrounds on Saturday. The day has been dedicated to the memory of long-time fan Barry Stead, who died last year. Racing starts at 10:00am and spectators are more than welcome to come along to watch the Peewees, Superlites, 125cc and 250cc motorbikes in action. At Bell, the local State School will be hosting a triathlon at the school’s oval in 90 Dennis Street from 6:00am to about 1:00pm. It features individual, team, junior and nipper events over distances ranging from 25m to 20km. The triathlon is a fundraiser for the school’s swimming club and spectators are welcome.